With a likely gap in critical weather satellite coverage beginning in 2016, the National Oceanic and Atmospheric Administration (NOAA) has not developed sufficient contingency measures to ensure that weather forecasts remain as reliable as they are today, according to three new federally commissioned reports and lawmakers at a House subcommittee hearing. Weather satellites provide invaluable data to forecasters and climate scientists alike, with polar-orbiting satellites, for example, providing at least 80 percent of the information that gets fed every day into sophisticated weather computer models. A gap in satellite coverage – a looming possibility post years of mismanagement, budget difficulties, and technical troubles – could significantly reduce the government’s ability to anticipate major storms and protect life and property, which is the main mission of NOAA’s National Weather Service. 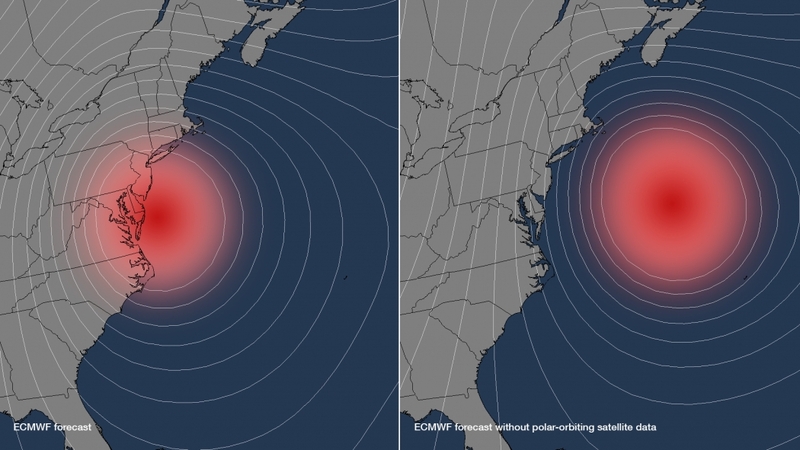 The Hurricane Sandy forecast from ECMWF with and without the polar-orbiting satellite data. The precariousness of U.S. weather satellite infrastructure was driven home earlier this year when a “micrometeoroid” struck a geostationary weather satellite, forcing NOAA to rely on a backup satellite. But in the near future, there may be long chunks of time when there are no backups available. NOAA has been left scrambling to figure out how to compensate for what could be reams of lost data, a gap in coverage that may occur as soon as 2016 and could last for longer than a year. In a controversial finding, a report commissioned by NOAA found that the agency's best alternative would be to turn to China for help. The report said NOAA’s “silver bullet” solution would be for it to purchase data from China’s polar-orbiting satellites to compensate for lost U.S. data. China plans to launch its next generation of polar-orbiting satellites later this year and in 2014, ahead of the U.S. new polar-orbiting satellites, and the capabilities of the Chinese satellites are expected to be comparable to U.S. spacecraft, the study said. The European Center for Medium Range Weather Forecasts, which maintains one of the most accurate medium-range weather models in the world, already incorporates the Chinese data in experimental ways, and plans to use it operationally if there is a data gap from U.S. satellites, the study said. In the U.S., however, concerns about national security have held back any use of Chinese weather satellite data. Washington has recently criticized Beijing for alleged Chinese computer hacking of American companies, and Chinese space firms have long had ties to the country’s military. At a joint hearing on the weather and satellite program, held on Sept. 19 by the House Science Subcommittees on Oversight and Environment, lawmakers from both parties sharply criticized NOAA for considering buying data from the Chinese government. Instead, they urged NOAA to consider purchasing data from commercial satellite providers that are developing fleets of small satellites that could be used for weather forecasting and environmental monitoring. “I have grave concerns about incorporating data into U.S. systems from a country well-known for its persistent and malicious cyber attacks against our nation,” said Oversight Subcommittee chairman Paul Broun (R-Ga.). Rep. Dana Rohrabacher (R-Calif.) said going with commercial vendors, rather than Chinese data, would make more sense. “(There is) A pretty misplaced set of values here when we are more interested in Chinese satellite data and we are hesitant to use commercial data from our own commercial companies,” he said. Mary Kicza, who directs NOAA’s satellite service, said the decision whether to purchase Chinese satellite data would need to be a “whole of government” decision involving national security officials. The biggest risk of a data gap concerns polar-orbiting satellites, which continuously scan the planet from north to south. The satellites gather information on winds and moisture in the upper atmosphere, which is then fed into computer models that meteorologists use for making weather forecasts. The data from the polar-orbiting satellites is particularly useful for making medium-range predictions out to about seven days in advance. 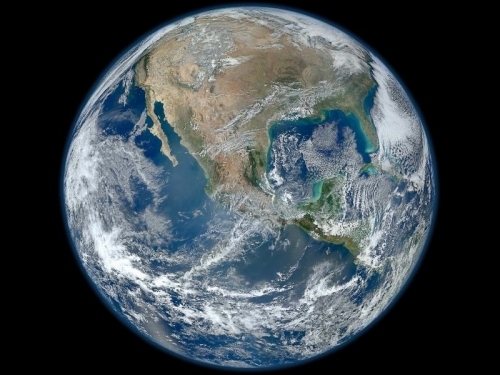 A “Blue Marble” image of the Earth taken from the VIIRS instrument aboard NASA's Suomi NPP satellite. The other weather satellites are known as geostationary satellites since they orbit above a fixed point along the Earth’s equator, keeping continuous watch on a particular swath of the planet. Images from these satellites, which are known by the acronym “GOES,” often appear on television weathercasts. 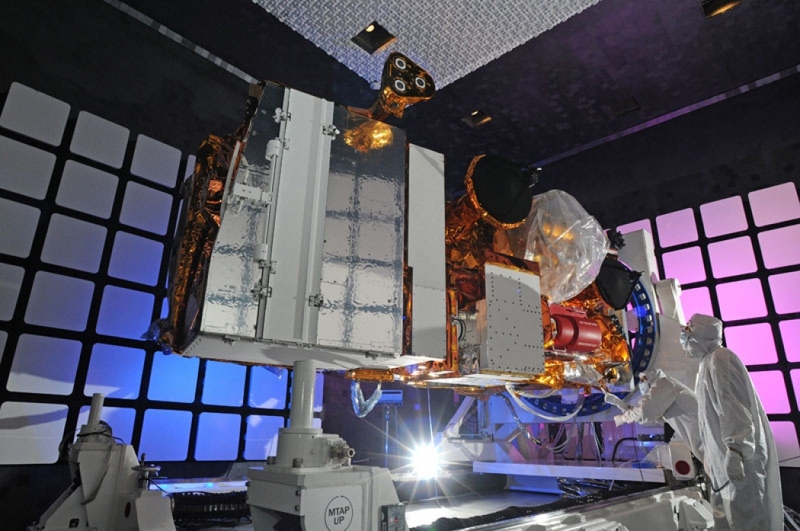 The likelihood of a data gap is much higher with the polar-satellite program than it is for the geostationary satellites, largely because of the limited design lifetime of current satellites and the launch schedule for the next generation of these spacecraft. Tests that have deprived computer models of some polar satellite data have shown that the model projections would be significantly less accurate, raising concerns about the reliability of U.S. weather forecasts when a data gap occurs. For example, experiments done using the forecast for Hurricane Sandy showed that forecast models would have shown the storm curving out to sea and missing the U.S., rather than taking its devastating hook to the west, into the New Jersey coast. That storm claimed 117 lives and caused at least $65 billion in damage. Accurate forecasts made several days in advance of the storm’s landfall were widely credited for saving lives. “A gap (in satellite coverage) would be catastrophic for forecasting by the national weather service,” Rep. Chris Stewart (R-Utah) said at the hearing. Because of mismanagement, billions in cost overruns, and technical hurdles, there has been a significant delay in launching the next generation of polar-orbiting satellites, known as the Joint Polar Satellite System, or JPSS. According to Kicza, NOAA anticipates that the first JPSS satellite from the $11.3 billion program will be ready for launch in March of 2017, at the earliest. However, that timeline is already past the design lifetime of the youngest polar-orbiting satellite currently in orbit, known as the Suomi-NPP satellite, and if there are any slips to the launch date, it would make a data gap both more likely to occur and longer than it otherwise would be. Kicza said faster development of the first JPSS satellite, combined with improved performance from the newest polar-orbiting satellite, known as the Suomi-NPP satellite, along with additional funds from Congress have reduced the likelihood of a gap in polar-satellite coverage. However, David A. Powner, the director of information technology management issues at the Government Accountability Office (GAO), testified that the likelihood of a data gap has not been reduced. “I’m not aware of the gap situation improving,” Powner said. The GAO released two reports on Sept. 19 pertaining to NOAA’s two main weather and climate satellite fleets. Both found that NOAA has not adequately planned for what to do in the event that it experiences a partial loss of its fleet. Some members of the House Science Committee said that NOAA’s own projections of the likelihood that it will suffer a gap in satellite data have been too “rosy” and unrealistic. Pre-launch Electro Magnetic Interference testing of the Suomi-NPP Satellite at the Ball Aerospace facility. “There was a time when we would all say that a gap in (satellite) coverage was unacceptable. Now what is unacceptable is not having a viable plan to address such a gap,” said ranking Democrat Suzanne Bonamici of Oregon. Republicans on the House Science Committee have been pushing for a bill that would re-prioritize weather and climate spending to place a greater emphasis on short-term weather production, thereby reducing funding for climate research. The full Science Committee has not yet taken up the bill, known as the Weather Forecasting Improvement Act. At the hearing, Broun said the Obama administration should consider spending less on NASA climate satellite programs in order to put more money in the weather satellite program. Democrats are opposed to pitting weather and climate science funding against each other, saying that spending for climate science is not the same as spending for global warming research.